Pulling up to Simi Valley City Hall the morning of October 21, EPA staffer Vicky Semones was counting on a quiet, efficient work meeting. Her job was to coordinate the scientists, public officials and community representatives monitoring the cleanup from decades of nuclear and chemical experimentation at the Santa Susana Field Laboratory, Rocketdyne’s testing ground for the dawning nuclear age. 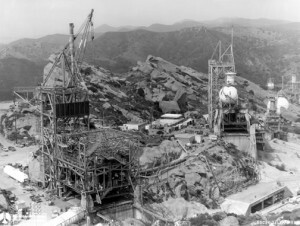 A previous June session of the cleanup committee had turned into a PR nightmare when a series of vocal public speakers criticized the laboratory and the cleanup, among them a former Rocketdyne employee, Dan Parks, who calmly recited a litany of accidents and radioactive releases at the Santa Susana lab (see sidebar). This time, Semones ordered the meeting closed to the public. It didn’t work. Semones was greeted at the City Hall entrance by a clutch of 20-odd protesters with signs saying “Stop Rocket-dying” and “Clean Up Your Goo!” Made up in equal measure of Simi Valley residents and anti-nuclear activists, the demonstrators, who had been tracking progress at Santa Susana for a decade and were in no mood to be ignored, forced their way into City Hall. After 10 minutes of heated debate in the meeting room, Semones suspended the session. The Santa Susana Field Laboratory Interagency Work Group hasn’t met since. Administered by the EPA, comprising nine officials from the EPA, the California Department of Health Services (DHS), the Department of Energy (DOE) and local air-quality officials, along with five community representatives, the work group is charged with coordinating a $58.5 million cleanup of the sprawling, 2,668-acre facility that straddles the mountains between the Simi and San Fernando valleys. Purchased by Boeing in 1996, the Rocketdyne lab tested nuclear reactors, MX missile engines and “Star Wars” lasers — and had a spate of nuclear accidents. It is currently developing the new generation of space-shuttle engines. Hostility to public input is just one of the areas where critics say federal and state regulators are helping Rocketdyne duck the fallout from its 40-year venture into the world of nuclear fission and caustic, toxic chemicals. In particular, they say state health officials delayed release of studies critical of the aerospace giant’s handling of hazardous materials, including surveys that found increased cancer rates among plant workers and nearby residents. The critics also accuse officials at the federal Environmental Protection Agency of granting waivers that will allow Rocketdyne to limit the costs of soil cleanup at the Santa Susana Laboratory. 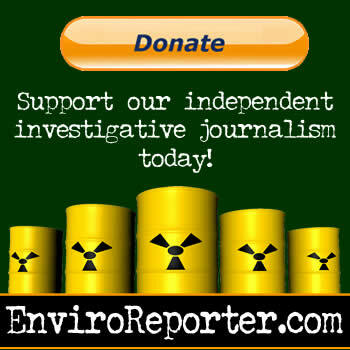 That allegation is denied by EPA officials, who share jurisdiction over the cleanup with the federal Department of Energy and the state DHS. But documents produced by Rocketdyne show that the company succeeded in setting the levels of radioactivity to be left in the ground to Department of Energy standards, levels that far exceed guidelines put forth by the EPA. While those levels are listed among the EPA’s national standards, the agency has yet to assert its more stringent cleanup standards with the other state and federal officials monitoring the Rocketdyne cleanup. The question arose in a 1996 safety review, when company officials proposed leaving ground residue of plutonium 239, which has a half-life of 24,400 years, at levels more than 13 times higher than normal EPA standards for preliminary remediation goals. For the poisonous radioactive isotope cobalt 60, Rocketdyne’s remediation levels are 450 times higher than the EPA’s guidelines — 1.96 picocuries per gram, instead of the required .0043. The Santa Susana Field Laboratory has a well-documented history of problems since it opened in 1948. On a hot July night in 1959, when Richard Nixon and Nikita Khrushchev flashed nuclear sabers in the televised “Kitchen Debate,” an experimental sodium-cooled nuclear reactor partially melted down at the site. A third of its fuel experienced melting, and an unknown amount of radioactive gases spewed from the unconfined building. The meltdown only came to light in 1979, when a UCLA student, working with Hirsch, discovered an obscure reference to it while conducting research on a term paper. That meltdown — considered the world’s first serious peacetime nuclear accident — was among a series of disasters to visit the 16 nuclear reactors operated on the site from the mid-1950s to the early ’80s. In 1964, a reactor designed for the space program also suffered a fuel-cladding melt, in which about 80 percent of the fuel rods melted. This resulted in a “substantial release of fission products,” according to a memo released by Rocketdyne’s predecessor, Atomics International. A fuel rod, oozing with sodium, exploded when cleansed with water in a “wash cell” a month before the meltdown. Subsequently, a leach field became contaminated with a high amount of radioactive strontium 90 and was left undiscovered for 14 years before being dug up and hauled away to a waste dump. While radioactive contamination has kept Rocketdyne in the news, widespread chemical pollution could prove equally hazardous. Records show that for 25 years the company used hundreds of thousands of gallons of solvents to clean test-stand assemblies. The resulting pollution reputedly has been staggering, especially in the ground water. Levels of the chemical hydrazine, which is dangerous to human life at 50 parts per million, have been measured in well water as high as 5,800 ppm. Chemical experimentation has resulted in its own calamities as well. A 1994 explosion, exactly 35 years to the day after the sodium-reactor meltdown, killed two Rocketdyne scientists. The company paid a record $6.5 million federal fine and pleaded guilty to felony environmental crimes involving illegal disposal of hazardous materials that resulted in the deaths of the two. “The public has been clearly unaware, as the union boys have been, as to what is really going on up there and what they can really be exposed to,” said attorney Ed Masry, who represents more than 200 residents in individual lawsuits against Rocketdyne. Rocketdyne is currently the target of two class-action lawsuits potentially representing hundreds of thousands of plaintiffs residing downwind of the laboratory. Last year, the company settled out of court with the Brandeis-Bardin Institute, in eastern Simi Valley, over charges that Rocketdyne polluted the institute’s ground water and devalued its property. That work group, the interagency task force coordinated by Vicky Semones, came about through the efforts of the Rocketdyne Cleanup Coalition, formed in 1989 to combat Rocketdyne’s request for a 10-year renewal of its special nuclear-materials license. The coalition managed to thwart the request, and Rocketdyne announced in April 1990 that, with the exception of cleanup work, nuclear activities at Santa Susana would end forever.